The street collapsed Sunday on E Boston Street as crews from the Philadelphia Water Department responded to a water main break. A street collapsed and swallowed up two private vehicles following a water main break in the Fishtown section of Philadelphia Sunday morning. 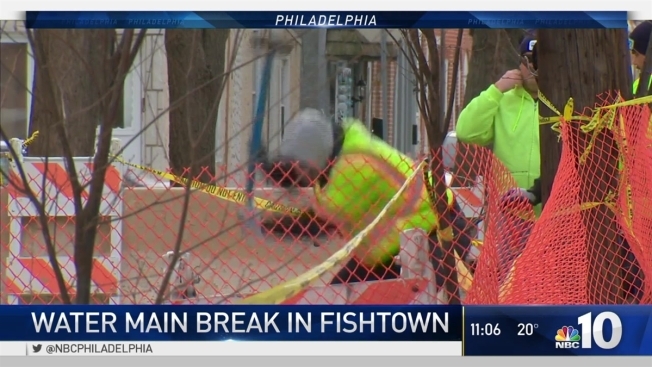 The street collapse occurred around 9 a.m. on East Boston Street as crews from the Philadelphia Water Department responded to a water main break. The collapse -- blamed on a sewer break -- swallowed up an SUV while another teetered on the edge. "I heard a boom," said Alyssa Banks, whose Kia Soul fell into the hole. "I happened to come out a little after 9 and looked to my left and was like 'that's my car.'" 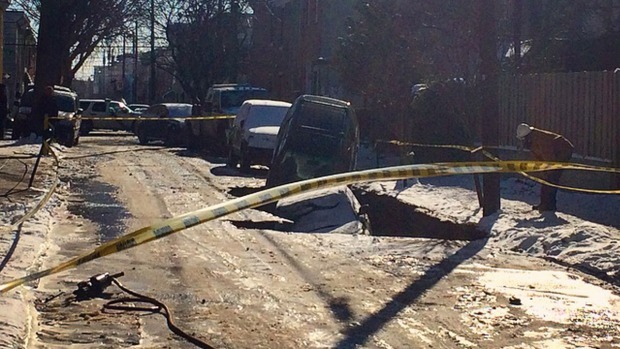 Residents on a block in the Fishtown section of Philadelphia are without gas and water after a sink hole swallowed up a car during a water main break. NBC10's Aundrea Cline-Thomas spoke to the residents, some of whom are dealing with the bitter cold temperatures without any heat in their house. Bennett Daniels’ Subaru didn’t completely fall in the hole but was teetering on the edge. "I’m a student so I don’t have too much income," Daniels said. "I rely on my car for the small jobs that I do get." Water Department officials say a broken sewer likely caused the water main break. Residents on the block are without water while about half the block is also without gas, meaning no heat on a bitter cold night. "I have no water so that’s a little bit of an issue," said Steve Petroski, another homeowner on the street. "I have to find somewhere to get a shower tonight." Crews with the Water Department continued to work Monday, removing debris from the sinkhole. They also removed Banks' car. "I think a lot more of the damage to the car is from the extraction," she said. Even after all utilities are restored however, repairing the road will take even longer.